Thanks to a generous grant from the LEA Endowment for the Arts, Mary Wickentower, of Polished Puppet Productions launched “Cinema!” for the LEA Full SIM Art Series, running through the month of September. “Cinema!” is a tribute to Machinima, and the talented movie makers, designers, creators and performers in SL. Hurry over and have a look before it comes to an end. You can see a review of the show by Victoria Lenoirre of the University of Western Australia here. Mark your calendar for 12 o’clock NOON SLT on Sunday, September 30, 2012 when the master of Particle Performances, Spectr3 Belfire will headline the closing ceremonies for “Cinema!” with his spectacular particle show. Take a trip down memory lane and take back the ambiance of an earlier time – a time of elegance, when going to the cinema was luxurious, and the theatres were grand places; huge and ornate with immense balconies, high domed ceilings, massive red carpeted staircases and décor that rivaled the Vatican. Their equally impressive facades dominated that landscape. Even the cozy, smaller theatres had a rich character, where you could ease back in splendid surroundings and suspend all worries, leave you tribulations behind and enter a world of imagination. And then there was the drive in movie – a culture all to itself. The mammoth screen filled the sky, and you could hunker down with friends or family, cuddle in a fluffy blanket, and bury your head in a soft pillow, all in the comfort of your own car. The real life movie cinemas of today are colorless and sterile places, much like the work cubical that we spend our lives in. They leave us hungering for a touch of class, a bit of chic. Come take back the ambiance. But there’s more. 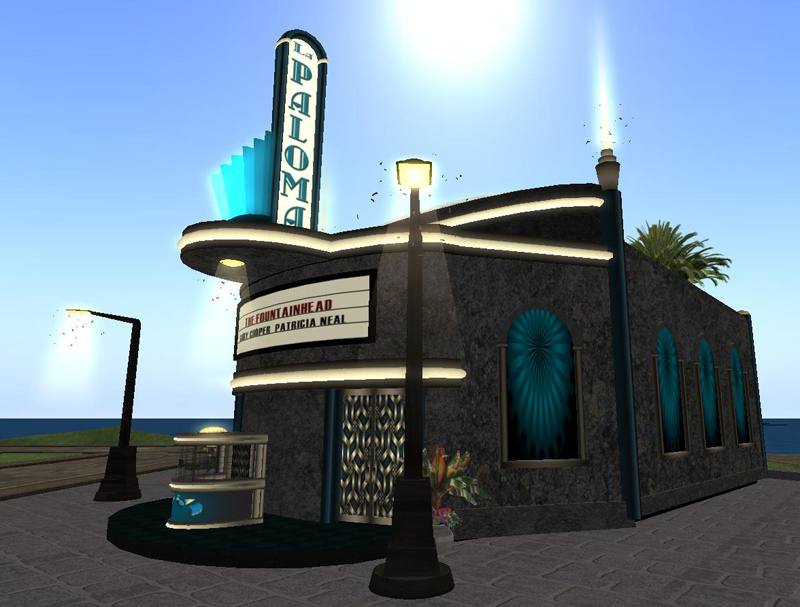 Each of the spectacular theatres featured in “Cinema!” also showcases films from the best machinima in Second Life. Relax in fabulous surroundings and watch films from LEA MOM; the 48 hour Machinima Film Fest; and the University of Western Australia’s MACHINIMUWA contests. The panorama of “Cinema!” also features a cozy home-style dinner and vintage gas station, all set in a 1940-1950’s California landscape. Bring a bike, brig a car, bring your honey or best friend and share in the experience of “Cinema!” and take back the ambiance! Walk through the ticket office and enter the main lobby, and you will catch your breath as the beauty of this grand palace style theatre unfolds. Rich marble, red and cream interior gives way to the grand carpeted, black marble and mahogany staircases which lead up to the highest tiers of private smoking rooms and elegant period bars. Ease back in elegant surroundings of the tiered main floor, the balcony or private boxes and enjoy some of the finest films in second life. The experience is everything you hoped it would be and more. Richly art deco, this smaller scale, but still magnificent theatre is an invitation to chic ambiance. Loving attention to detail makes this award winning gem shine. An animated ticket booth and a pair of sculpted, animated streetlights complete with moths add to the atmosphere. Custom textures add a note of elegance. This design was awarded Second Place in the Fall 2011 Virtual Museum of Architecture Build-Off. The impressive Drive-in screen is a generous donation by Ethos Erlanger, “passionate” builder and resident of SL since 9/12/2006. Mary Wickentower has been a Second Life resident since 2008, located in the snowlands of Sansara, mainland. Mary is a poet/writer songwriter, artist, SL builder and machinimatographer, and owner of Wickentower Art and owner of the film production company, Polished Puppet Productions. “Cinema!” represents a collaboration of some of the finest designers, creators, builders, machinimatographers in Second Life and is a tribute to their amazing talent. Next Post: There’s fun noir in Episode 3 of The Blackened Mirror with jigsaws and an exclusive short story!